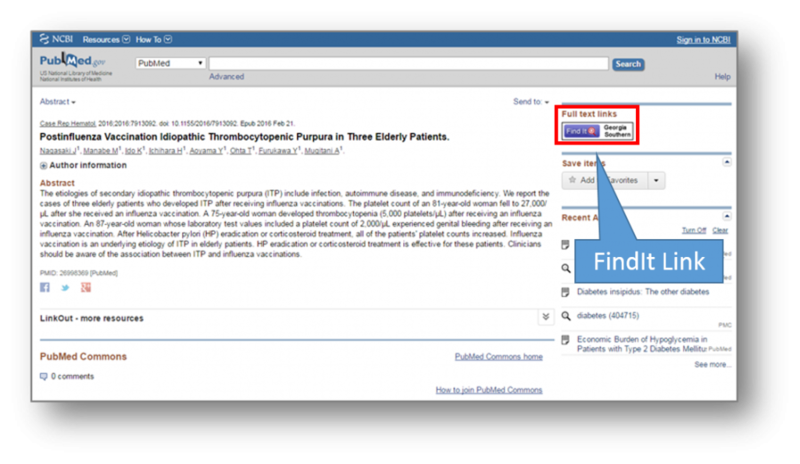 The library is excited to announce that FindIt full text links are now available for all results in PubMed. Simply visiting http://www.ncbi.nlm.nih.gov/pubmed or www.pubmed.gov will not produce our FindIt full text links. To take advantage of this service, you must use one of the library’s PubMed links. FindIt links will appear for every article in PubMed, regardless of whether the library provides full text access to the article or not. Also, new articles appear very quickly in PubMed, often in advance of publication or before full text of the article becomes available in the library’s databases. For very new articles, full text may not become available for several weeks following their appearance in PubMed. In either case, please feel free to submit an ILL request for the article using the “through Interlibrary Loan” link under the InterLibrary Loan (ILL) header in the Find It menu for the article. For more information about ILL, see this page on the library website. If you have any questions, please contact the Information Services Desk at (912)478-5645.